Located in the golden city of Jaisalmer, the Jaisalmer Fort is one of the largest desert forts in the world. The fort is surrounded by endless stretch of sand of the Great Indian Thar Desert. 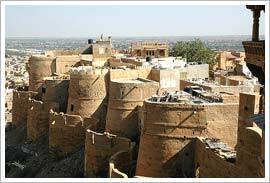 Its foundation was laid by Rawal Jaisal, the Bhati Rajput ruler, in 1156 AD. The fort derived its name from its founder. Situated on Trikuta Hill, it seems as if the fort has directly come out from a storybook. The fort had been a witness to several battles but still it stands erect speaking volumes about its bravery. Notice the remarkable change in its color from tawny lion color to beautiful honey-gold as the day draws to a close. This change in its color make it look like a part of the desert. May be this is the reason why it is nicknamed as the Golden Fort. It is the second oldest fort of Rajasthan. Jaisalmer Fort is fortified with three layers of walls. The outermost solid stone layer, the second layer circling the fort and the third and the innermost wall served a great purpose of defense during the battles fought at the fort in the bygone era. From here the warriors would throw boiling oil and water and big rocks on their enemies for defense. The architecture of the Jaisalmer Fort is a beautiful amalgamation of Rajput and Mughal architecture giving it a different look altogether. The towering fort has a height of two hundred and fifty feet and it gives a picturesque view of the city. The fort saw a disastrous attack in the thirteenth century by Ala-ud-Din Khilji. The fort remained under his control for nine years. Before the royal ladies of the fort would be harassed by the enemy, they decided to commit 'Jauhar' (self immolation) to save their self-respect. Once the entire population of Jaisalmer used to reside in this fort but with gradual increase of population of the city they had to move out of the fort to find a shelter elsewhere. Some of the major attractions of the fort are Raj Mahal (The Royal Palace), Jain Temples, Laxminath Temple, Four huge Gateways and the huge Merchant Havelis. The fort houses 99 bastions. The fort was also an inspiration for the famous Bengali Film Director Satyajit Ray who wrote a novel on the fort and made a film as well.